Beautiful work and attention to detail. I’m sure you’ve thought about it, but with the bottle and MRP box mounted, have you left yourself enough room to fit a pipe and enough clearance for the rear wheel? Thank you for the complement! I'm just using an old beat up Sito+ exhaust muffler that I found in my shop, so no fancy pipe (though I think a PM Tuning up-n-over pipe would look spot on for this particular project). It took some heating and bending of the down tube to fit the Sito. 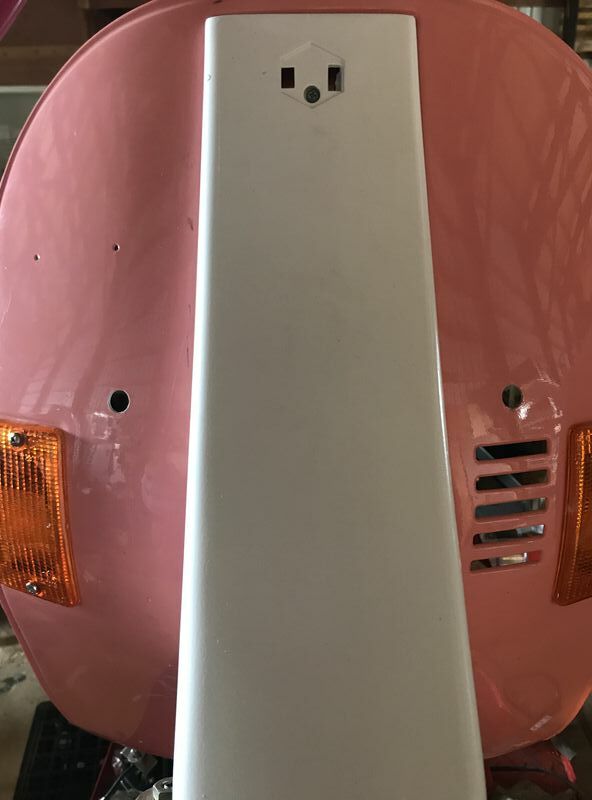 As for clearance for the rear wheel, I had someone sit and bounce on the rear while I was hanging off of the back of it. I couldn't see that it was rubbing anywhere. Of course there's no way I can dismount the tire with that MRP box installed. It will require me to remove an additional 4 bolts to remove the box, but it will be well worth it to have all that extra space! I went down to the local TAP Plastics, and bought some pieces of HDPE, ABS, and acrylic. 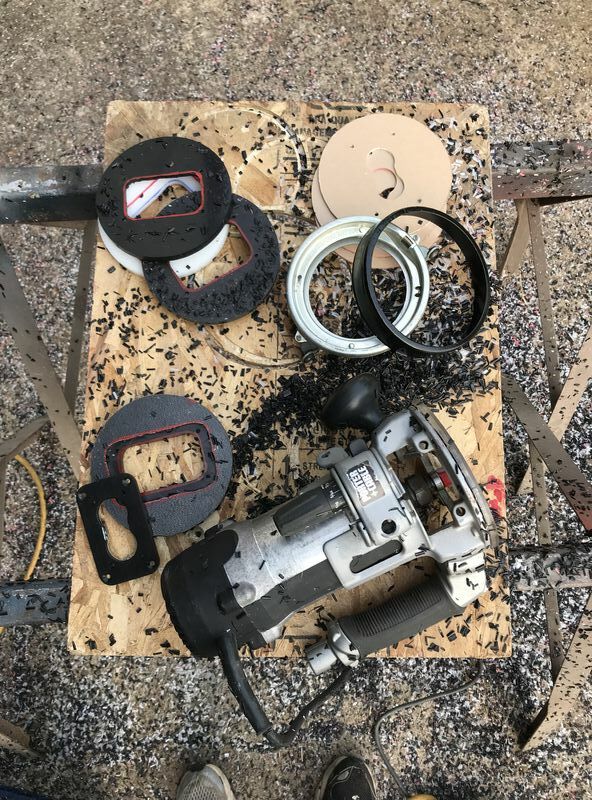 Used a circle cutter jig on my router and went to work. There was LOTS of plastic bits everywhere! And here it is with all of the bits and pieces laid out, ready to be assembled. A front view of it mounted in the OEM bezel. A view of the back side. And for the final unaveiling! I like that a lot, practical but customized to go with the rest of the bike. I finally understood that it's all done now and the pink background was by design and even protected during fabrication. So no glass lens over it that would spoil the intended light pattern I reasoned, but what about a plain glass clock face cover of the right size to protect things from the weather? 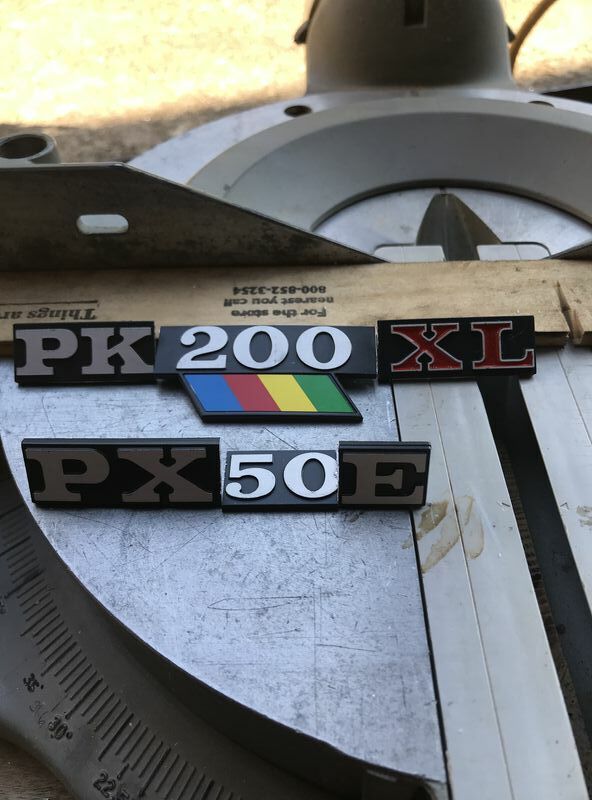 I was gonna do that on this project until I found an old motorcycle lens that fit. 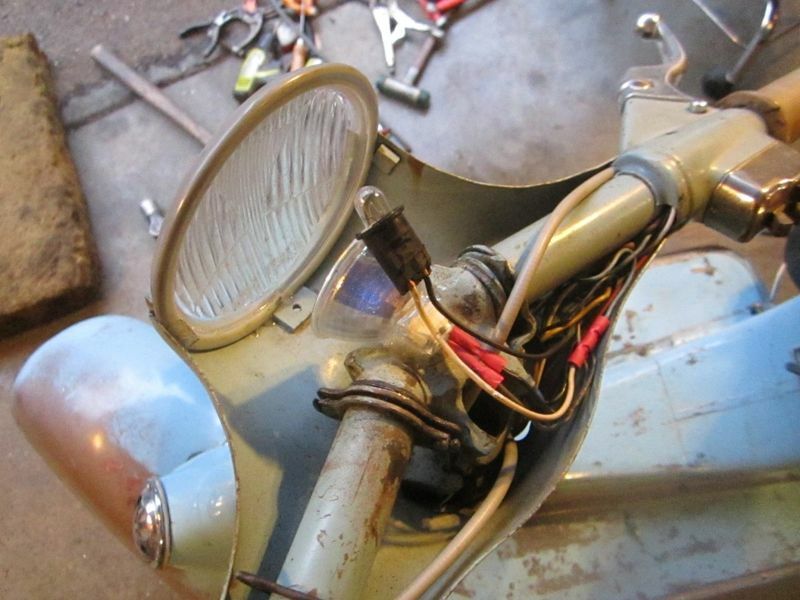 This is temporary until I find a proper headlite rim that fits an old AllState split sheetmetal headset. The 40 watt 12V spotlite works well for now to be seen by others, but no good for seeing down dark roads. Installed w/ Shoe Goo which is great for this kind of bodgery - tuff, but removes without a trace. Lens & both lites glued on. That's very creative with your headlight Voodoo. I think the standard headlight looks 10x better than the LED that i used, but the LED that i used is probably 15x brighter than the original 35 watt sealed beam. I'd also be concerned that if i used a glass lens over the top of my LED that i would mess up the light pattern. 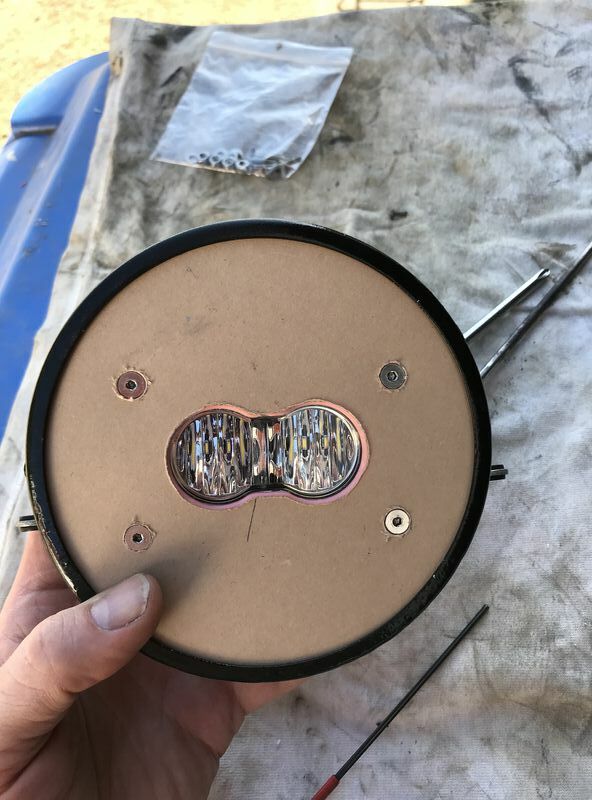 I ordered my LED with a "wide cornering" lens. The light pattern has a little bit more of a cutoff, but has a very wide and low spread of light. I don't have any concerns about protecting the headlight assembly from the weather. How i have it, is exactly how all US market P's are. I've never heard anything regarding problems with it. 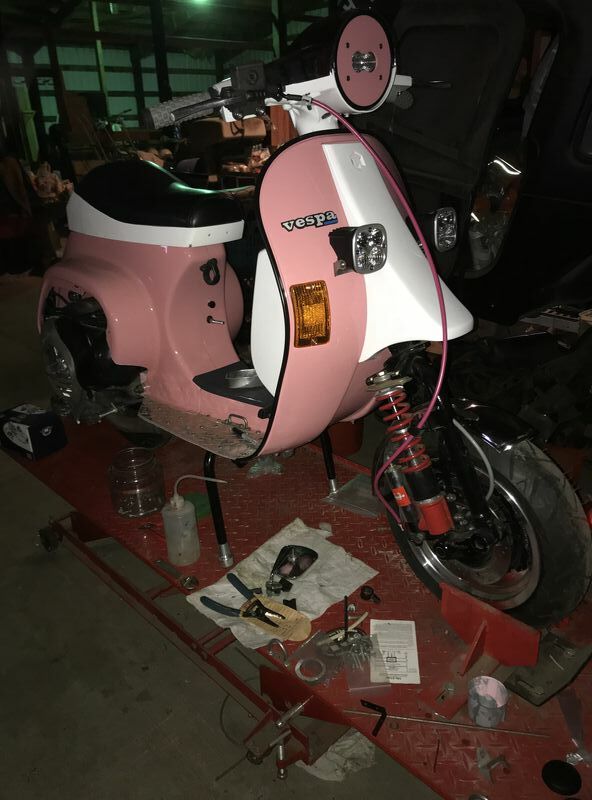 And as for that pink...i have no idea who decided to paint it that color, but when i first saw the frame, i started laughing out loud to the guy i bought it from! It was in such nice shape, that i had to preserve it at all costs. I can't wait to finish the project. When i take it out on the highway, heads will turn for sure. 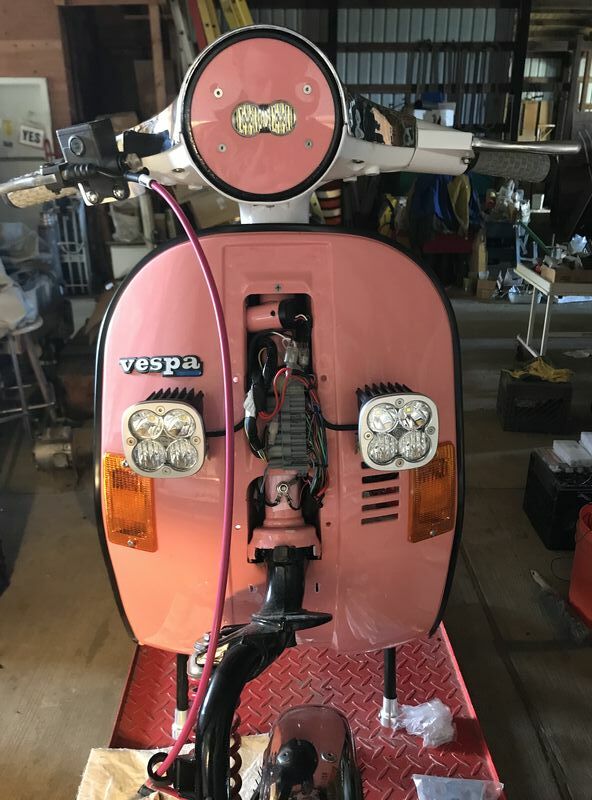 Imagine a pink scooter traveling 65-70mph+ going down the highway! That would be a sight for sure. 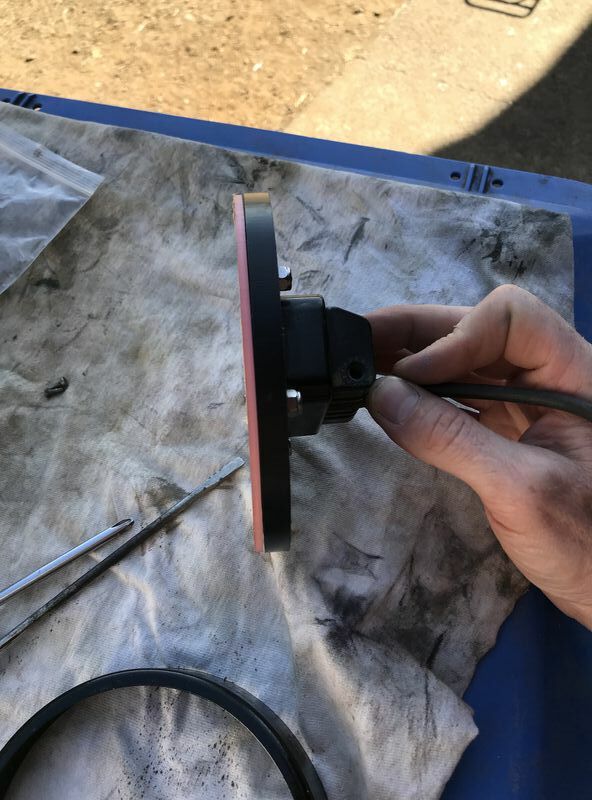 I installed a brake line and bleed the brakes. 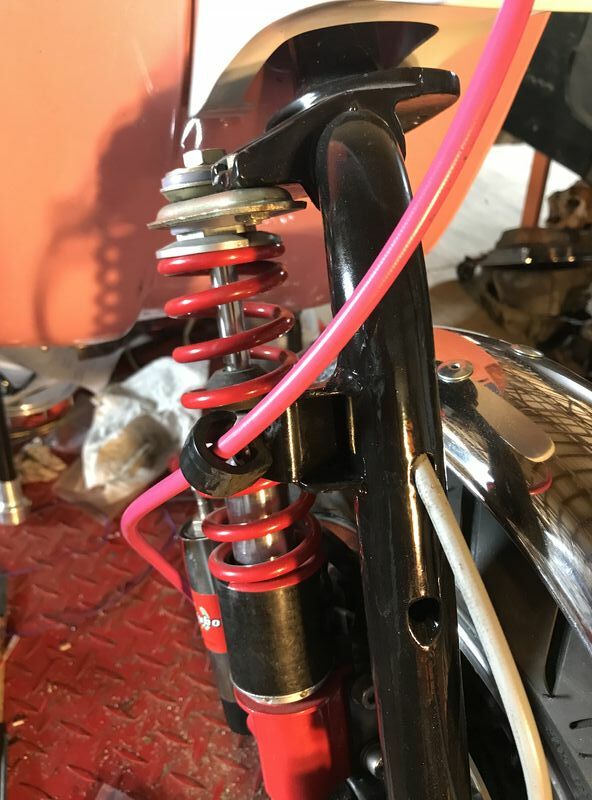 I ordered up what I thought was going to be a light colored pink brake line, but received one that was a bright pink. Oh well, it’s the thought that counts. 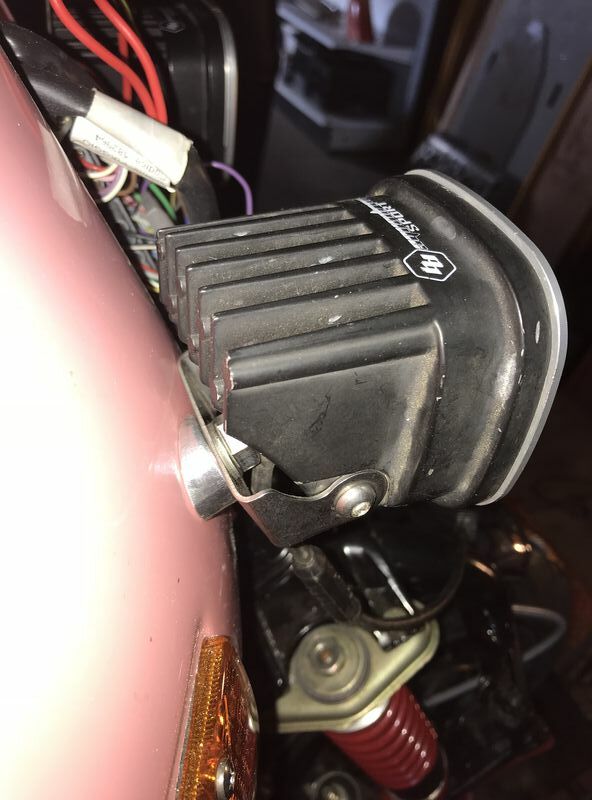 I also installed a brake light switch for the front master cylinder. 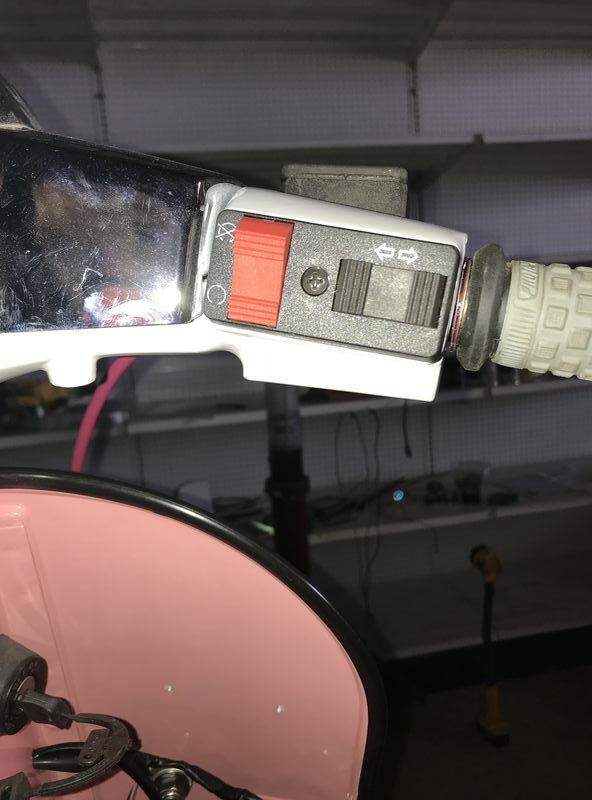 I decided to drill a hole in the lower headset to run the wire through. I was contemplating about just notching the upper headset (like a Stella), but this had a “cleaner” look to it, so I went that route. I decided to run the front brake line externally....meaning that I didn’t run it though the fork tube or the frame. It sure makes bench bleeding the system very simple. Since I routed the brake line the way I did, I needed a cable guide to keep it in check. 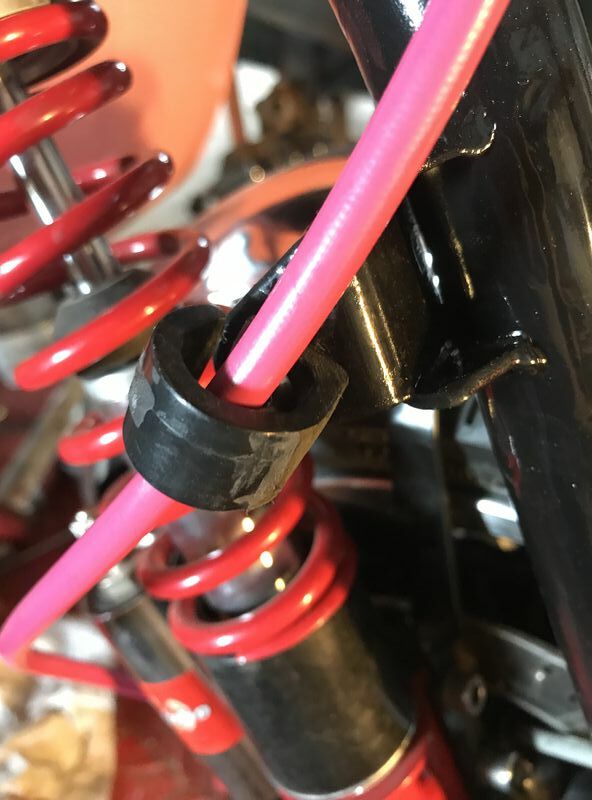 I sourced a cable guide out of my spare KTM EXC parts. 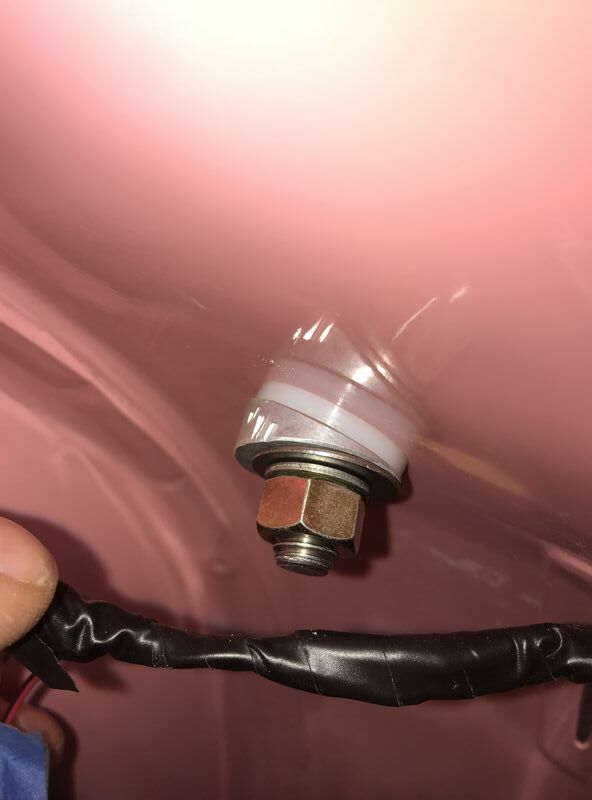 I bolted it to the fender support bracket. 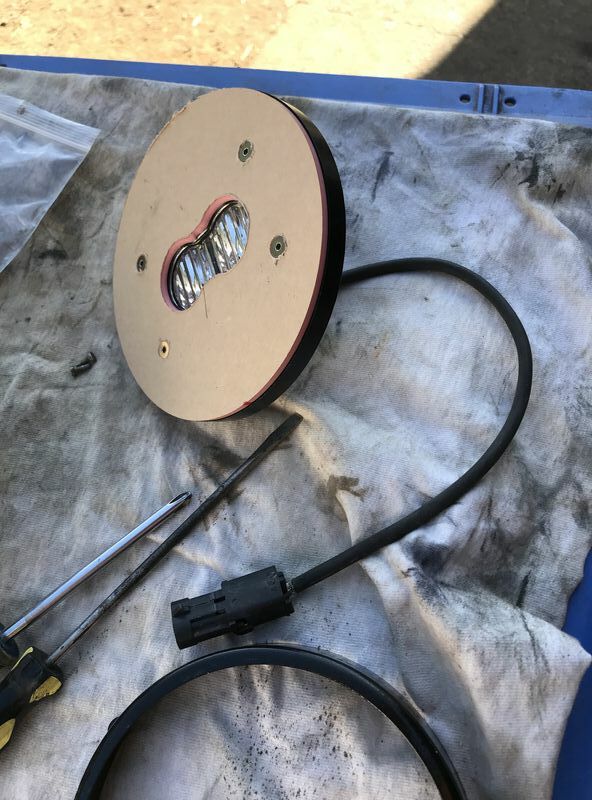 (Since I removed that fender support bracket a few months ago, I ended up welding it back on in a position that best suited the routing of the cable. A closer up view of the guide. 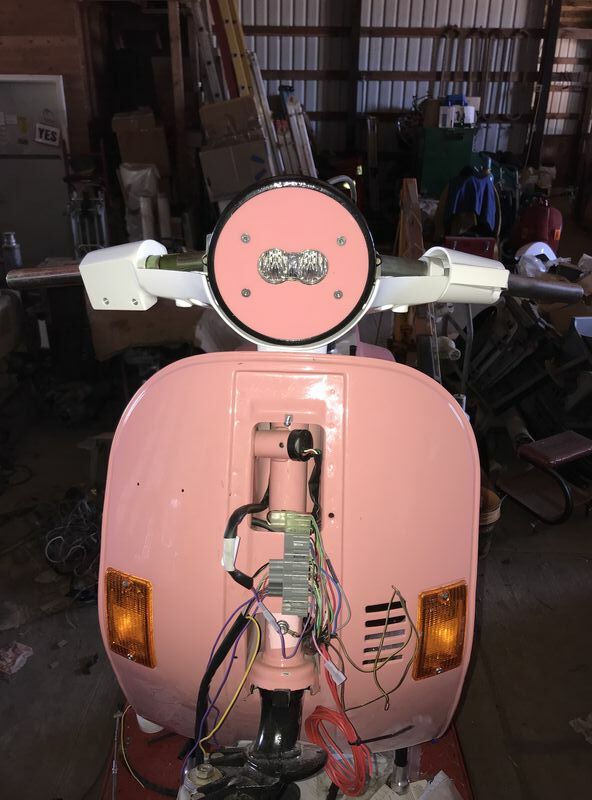 I’m also installed some auxiliary lights on the legshield. I marked it out on tape first. I assume you are just sorting your pics and won't leave us hanging? I hade to make some aluminum beveled tube spacers (1'' o.d. , 7/16" i.d.) so that the lights could be aimed properly. I’m sure somewhere online they’re available, but I couldn’t find that they existed. 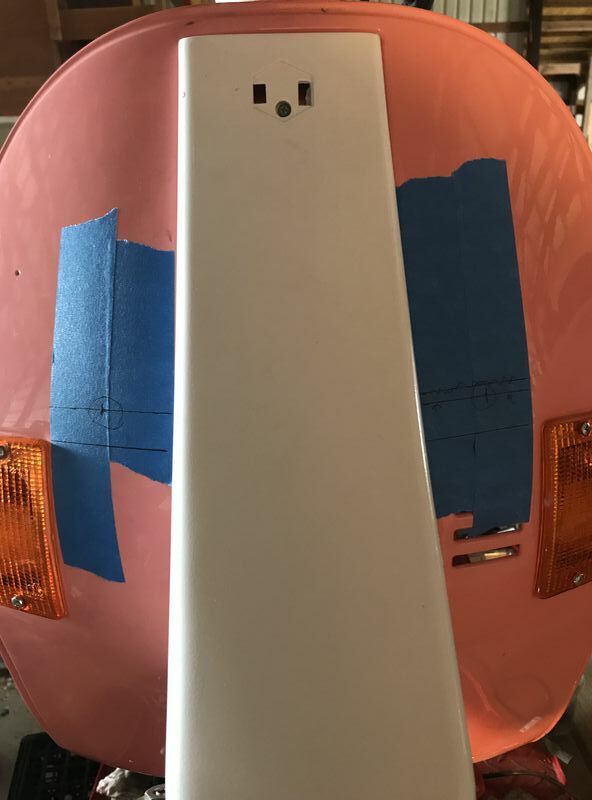 The backside of the legshield. Notice the plastic washers. Nicely none, they look store bought. I saw there's a guy on Amazon selling 3D printed ones. 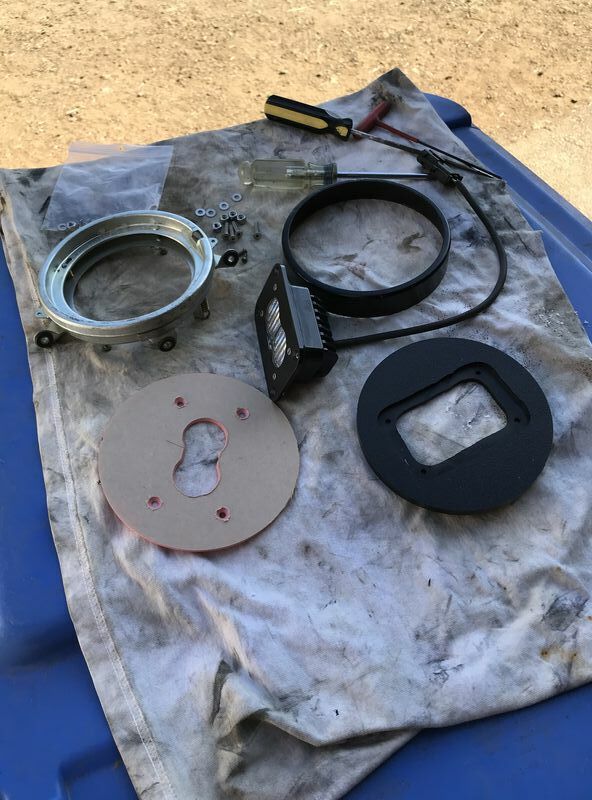 There’s supposed to be a washer behind the beveled spacer, but it didn’t make it into the pic. And what it looks like with both lights mounted. Thank you Voodoo. They took a couple hours to make. Lots of the time went into figuring out at what angle to make the bevel at. I went with about a 26 degree angle. Do you have a link to the ones you saw on Amazon? 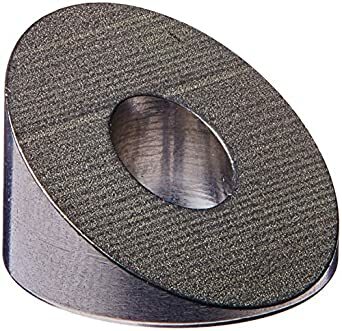 It just so happened that the local lumber yard had those Feeney spacers in stock...but they weren't quite the right degree of bevel, and they're a 3/4" o.d., and I needed a 1" o.d.. I would have gladly paid $22 bucks for a 4 pack. Time is money, and I had two hours into fabing up mine. But mine are also exactly the right dimensions though. 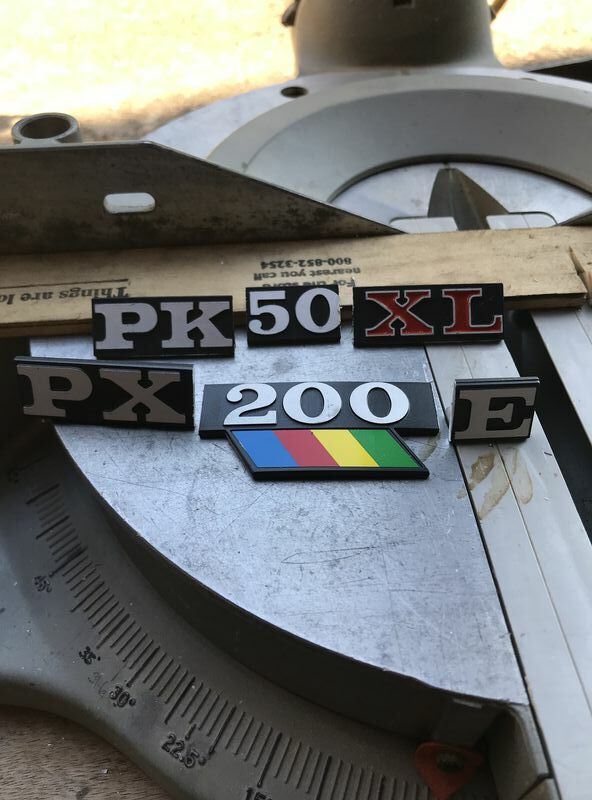 I installed a few emblems today. 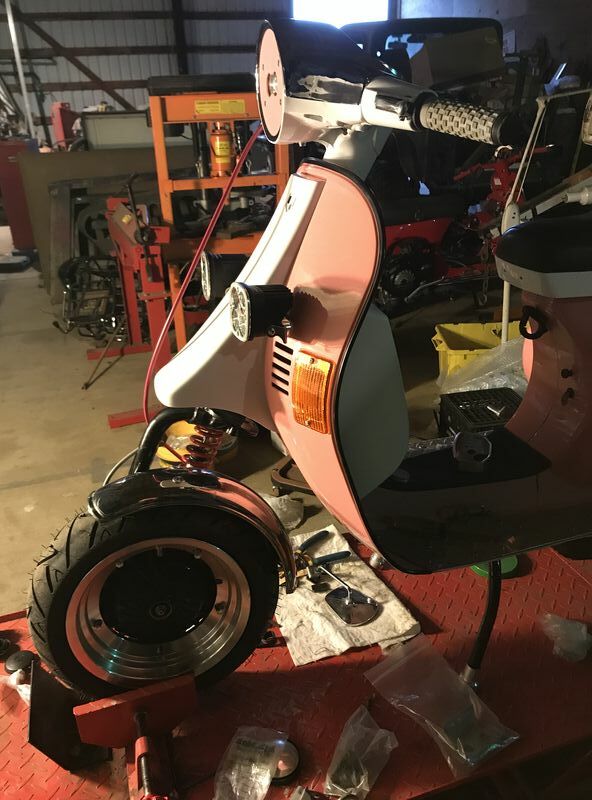 I was trying to decide which one is best fitting for this scooter. So I decided to make an emblem that would perfectly describe the scoot. The miter saw made some clean cuts. 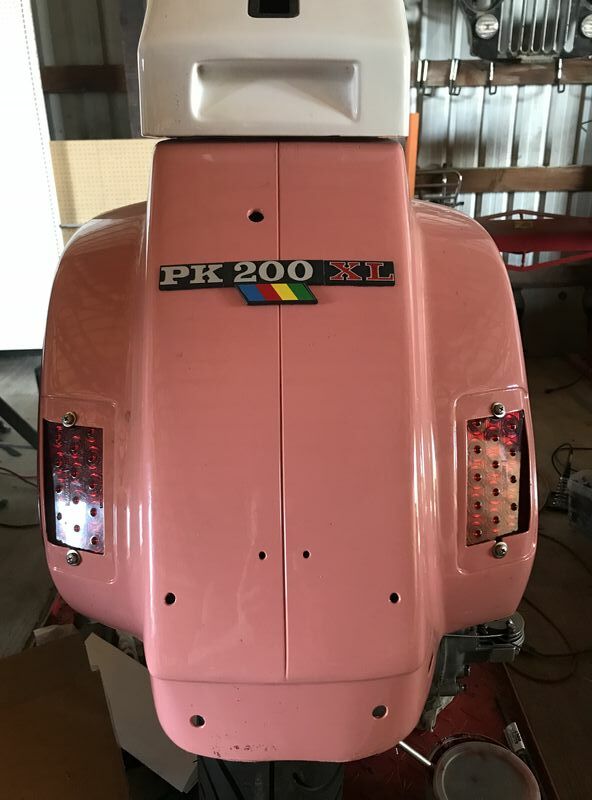 If anyone is planning on building a project scooter that involves stuffing a 50cc engine into a PX, well I have an emblem for you. I used 3M double sided tape to attach the 3 separate pieces to the frame. 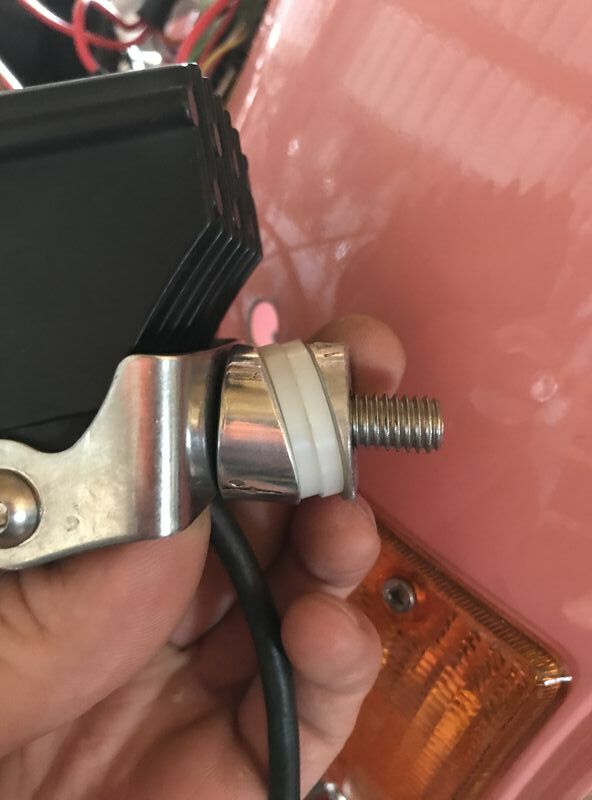 Finally after about 6 months, I got a hold of a Euro PX headlight switch (“shutter” switch style). I was hoping to buy a genuine Piaggio switch, but I couldn’t find anyone who can get them. 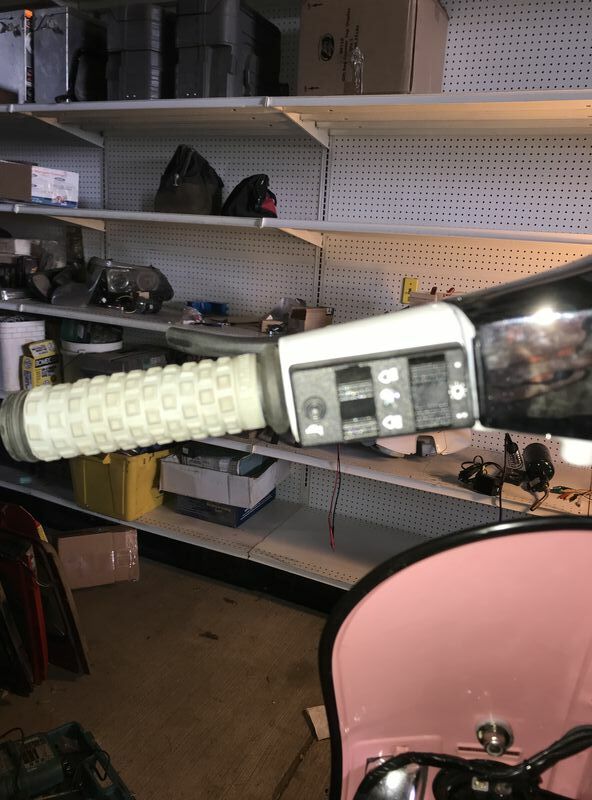 Here it is mounted on the “correct” side of the handlebars...well, it’s correct in the US at least. For some reason I woke really early this morning...about 2:30 am. I couldn’t get back to sleep, so I decided to go over to the shop. I completed pretty much the rest of the wiring today. I was at a stand still until that PX switch showed up, so now I can process again. Here’s a pic of what the back of the PX switch looks like. The first thing I did with the switch is desolder all of the wires so that I could wire it in a different configuration. 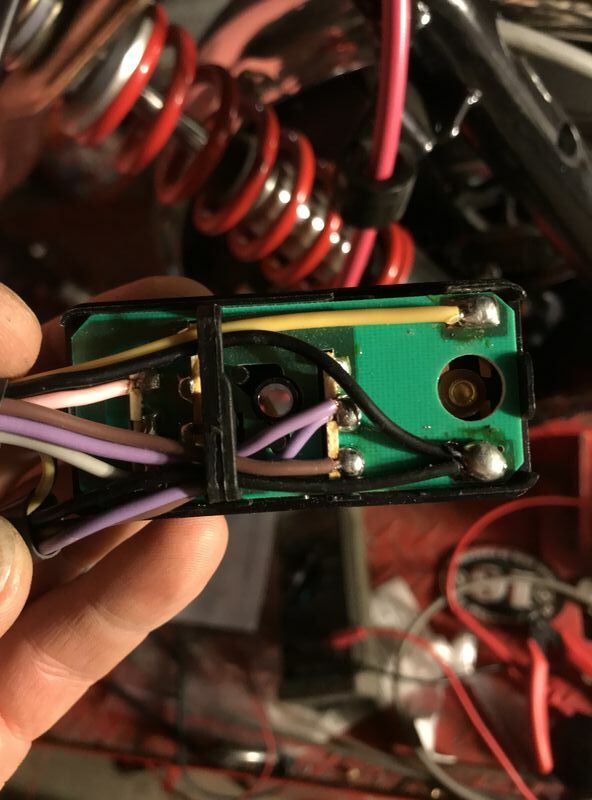 Note that I had to remove some of the copper (I had to break contact from a couple of the switch terminals) from the green board so that I could get the switch to operate how I needed it to. There is also a temporary grey jumper wire in the pic as well. 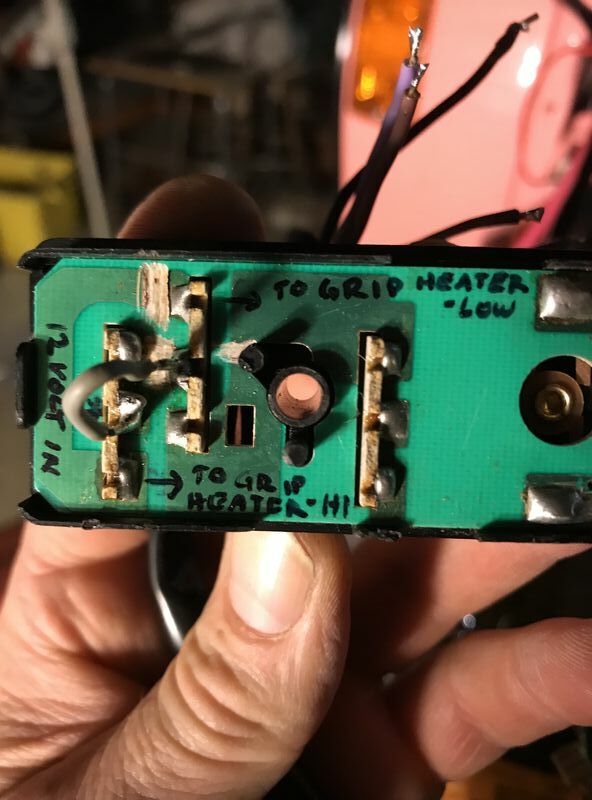 The 3 way on/off/pilot light switch got repurposed into a grip heater switch (low/off/high)...yes, I have grip heaters. 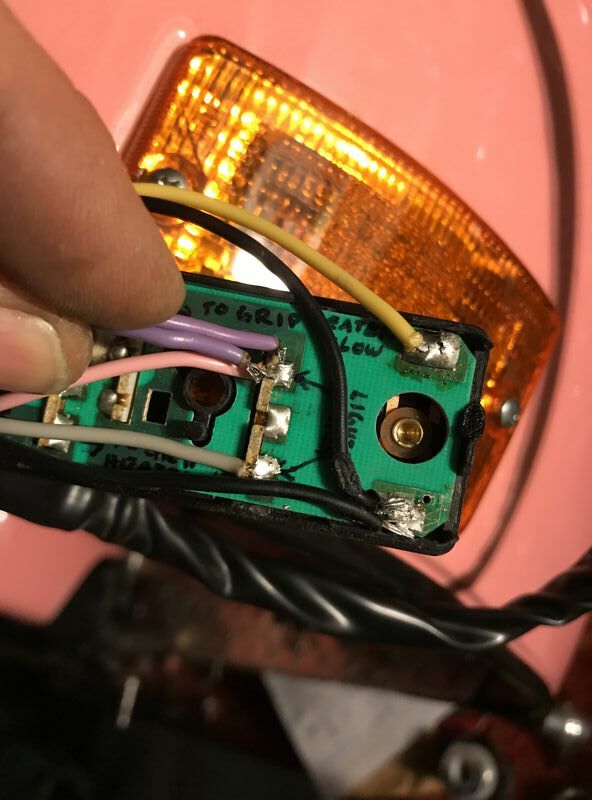 And since I’m using a LED headlight that I can’t dim, the high/low beam switch gets repurposed into a “on/off” headlight switch. That’s right, I can turn ALL of the lights off...including the front and rear brakes lights (stealth mode). 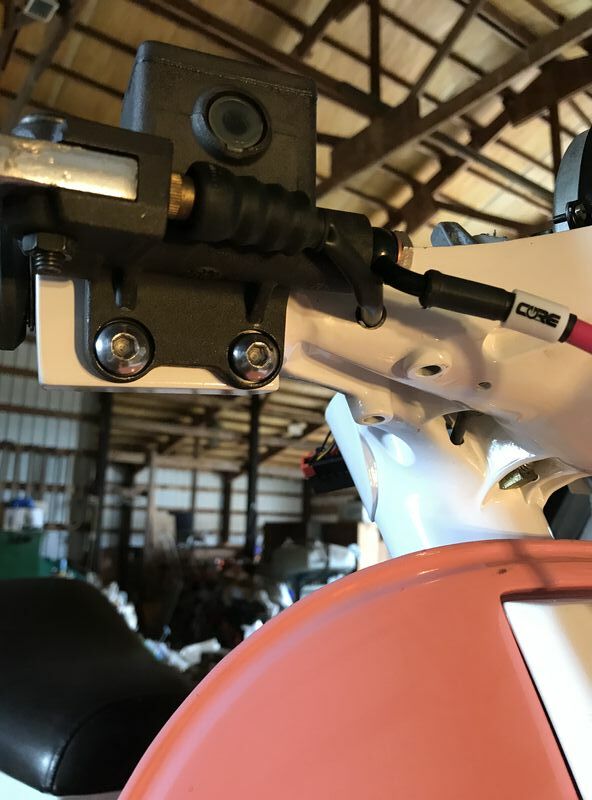 The turn signal/ kill switch is now a turn signal/ spot light switch. The red rocker switch now turns on both spot lights. 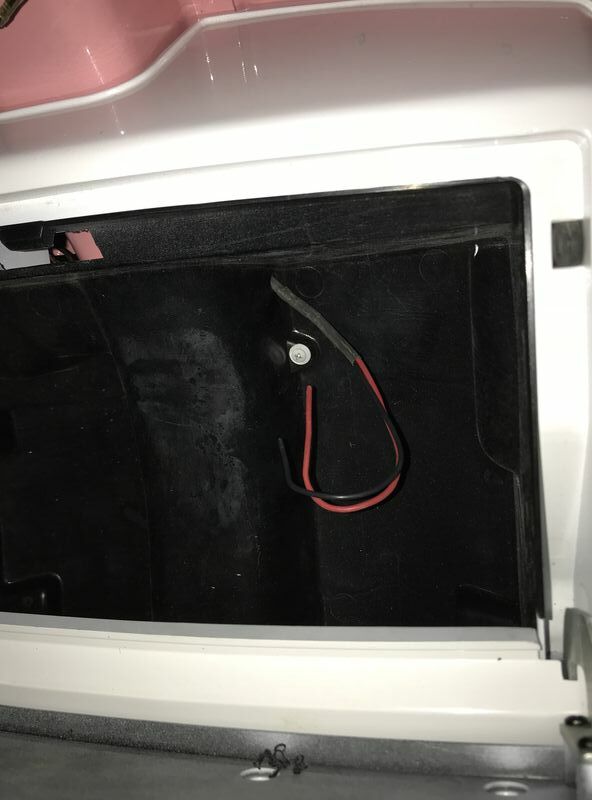 I did install a toggle switch on the glove box that can interrupt power to one of the spot lights if I so desire. 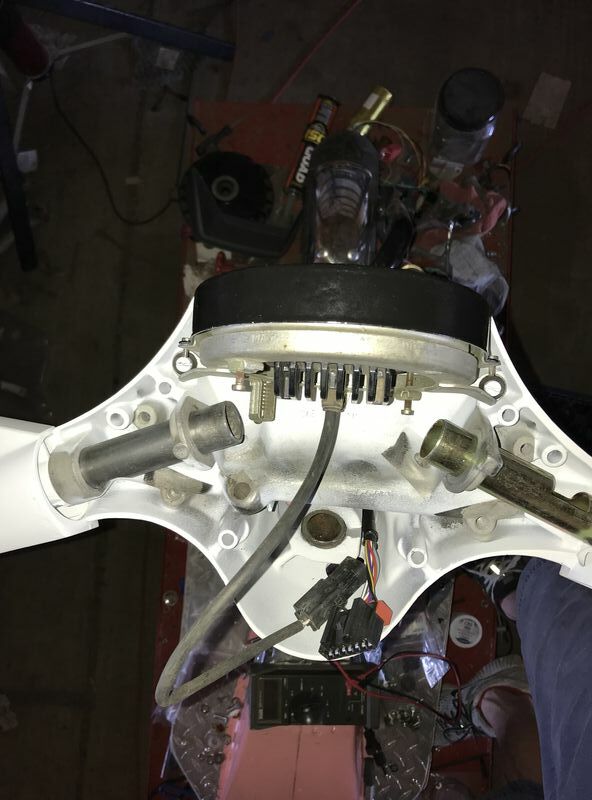 One reason for that is if the stator can’t keep up with 3 separate lights AND a pair of grip heaters. I’ll have to get a volt meter to see how much the battery can maintain with all of the electronics turned on. Here’s a pic of the main multi plug J box. 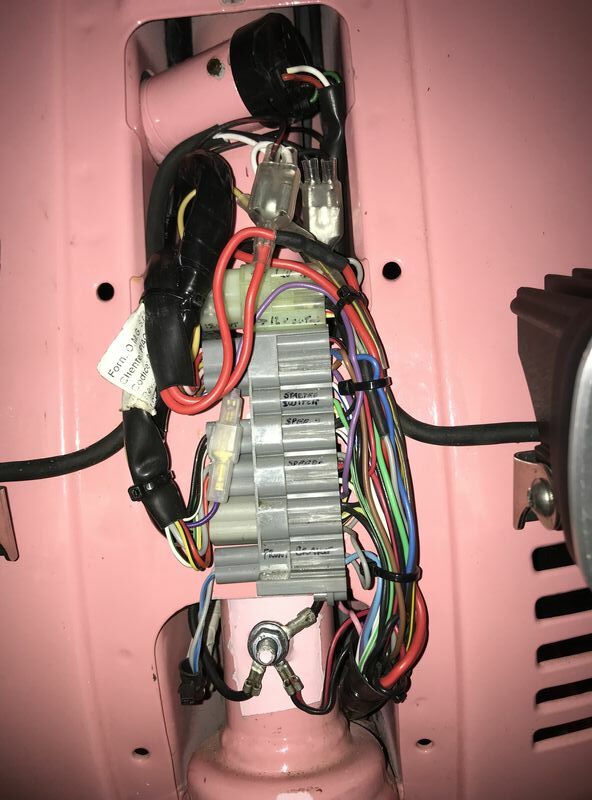 The spaghetti wiring doesn’t look too bad. 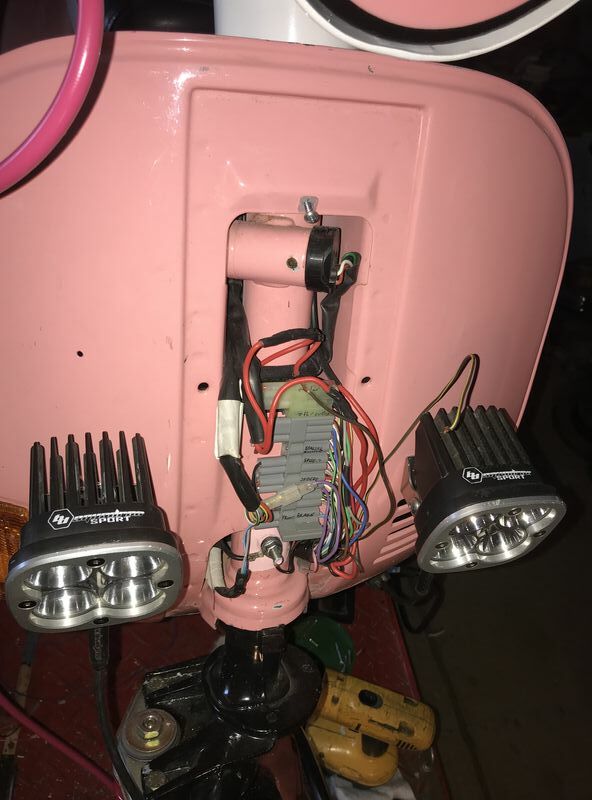 Since it was still dark by the time I finished enough of the wiring to aim all of the lights, I started up the engine and went down the road (at 4:30am) to aim all of the lights. It took about 20 minutes to aim all of the lights independently of each other. 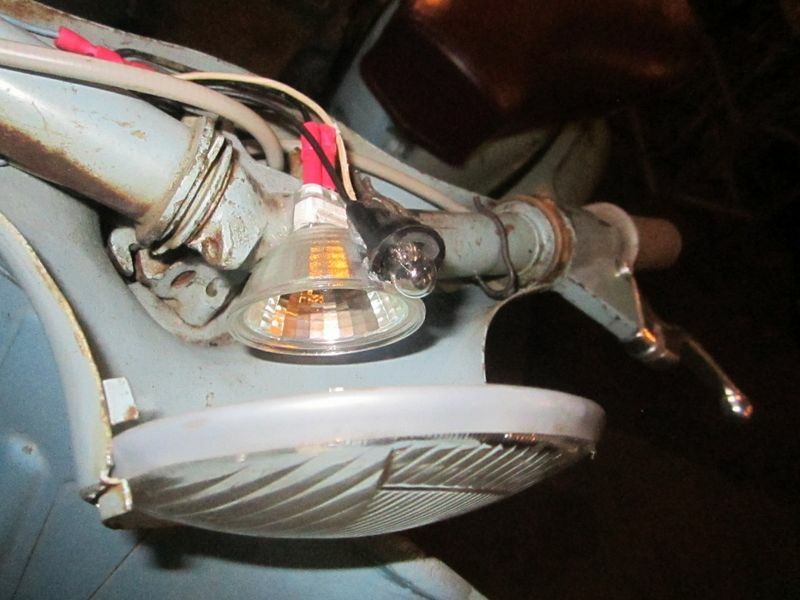 The main headlight gets pointed down, while the 2 spots on the legshield got aimed up higher and towards the ditches. And here’s what it looks like with the horn casting mounted. 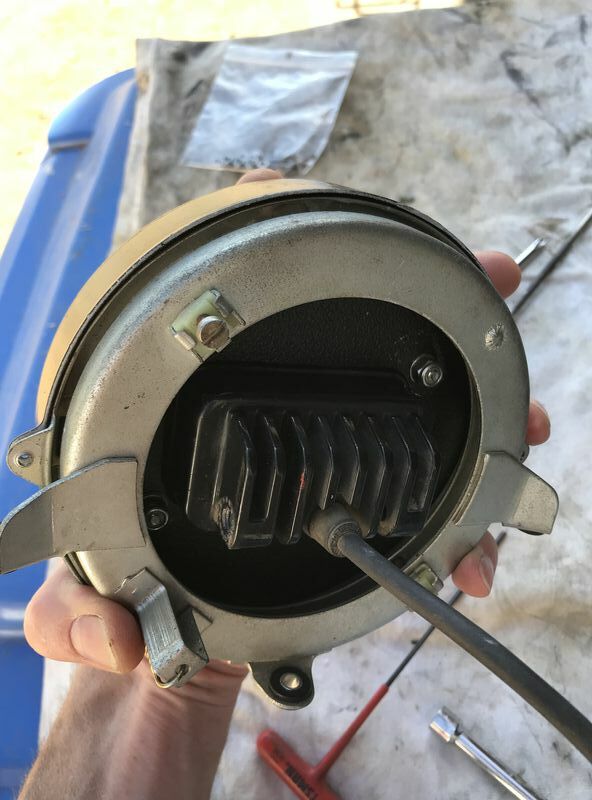 I also ran some wires into the glove box before I mounted to the legshield. There is contant power to the wires. 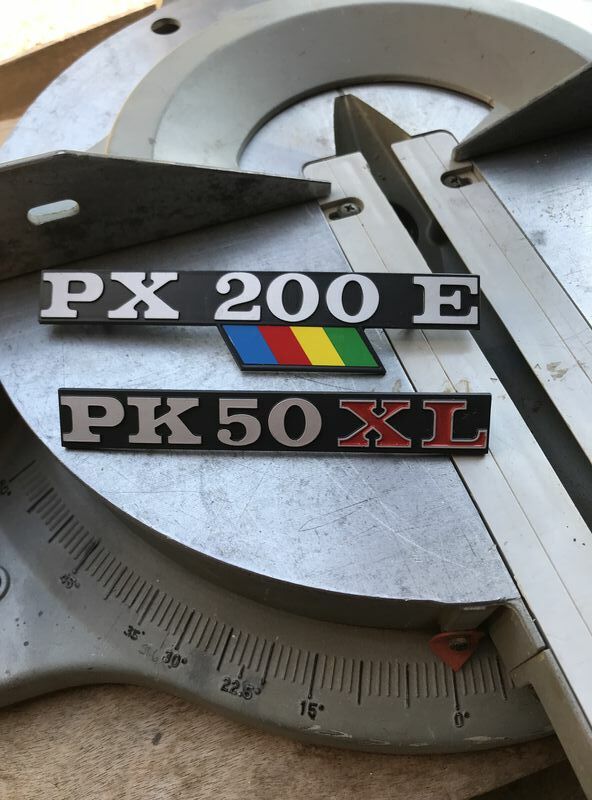 This will be for power to a GPS and a phone. I’m not exactly sure just what pigtail to solder to the ends just yet though. I’m definitely going to have to do something different with the seat. The mono post seat that’s currently on there looks good, but is very uncomfortable to me. I think I’ll have to buy a bench seat for it. I see that SIP has a few of them for sale. I have no idea what kind of quality they are. Hopefully they’re good, because I’m kinda eyeballing a white colored seat!